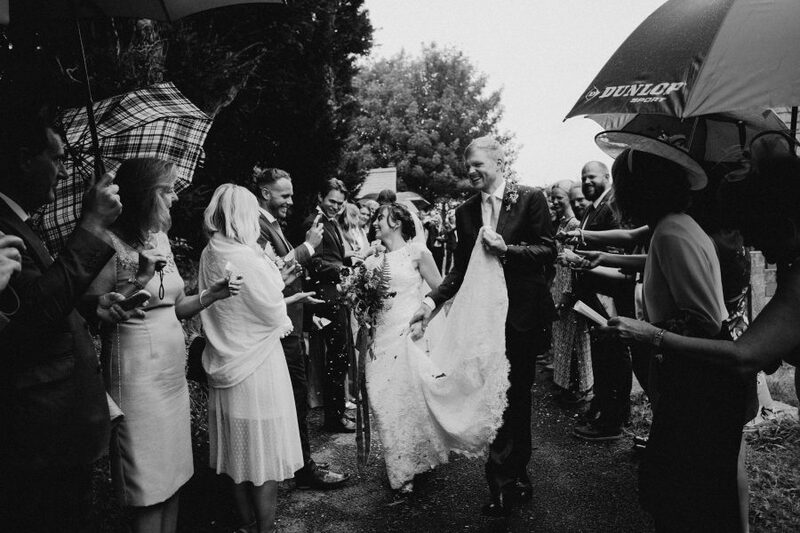 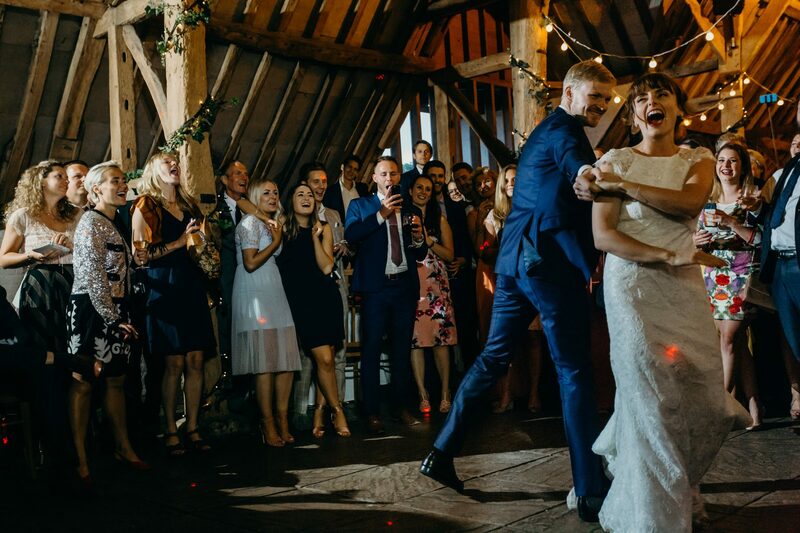 Laura and Gunnar’s Ufton Court wedding was a riot of colour, emotion, beauty and tradition. 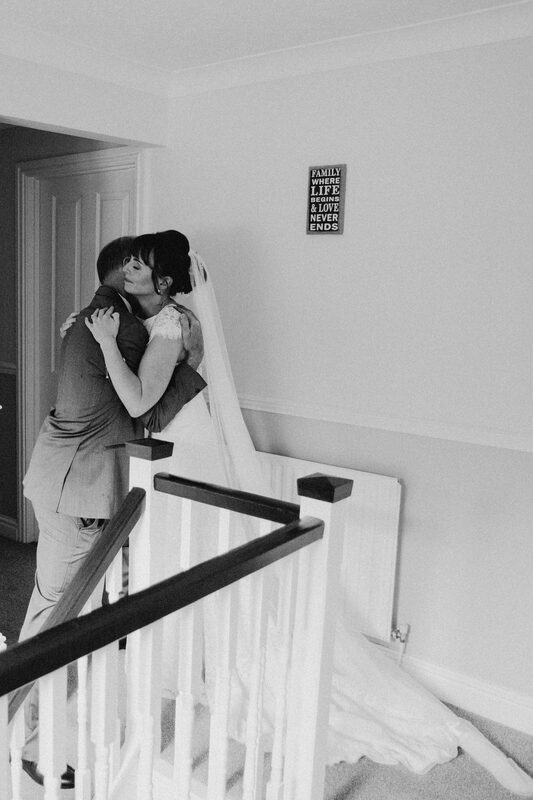 I enjoyed photographing every minute. 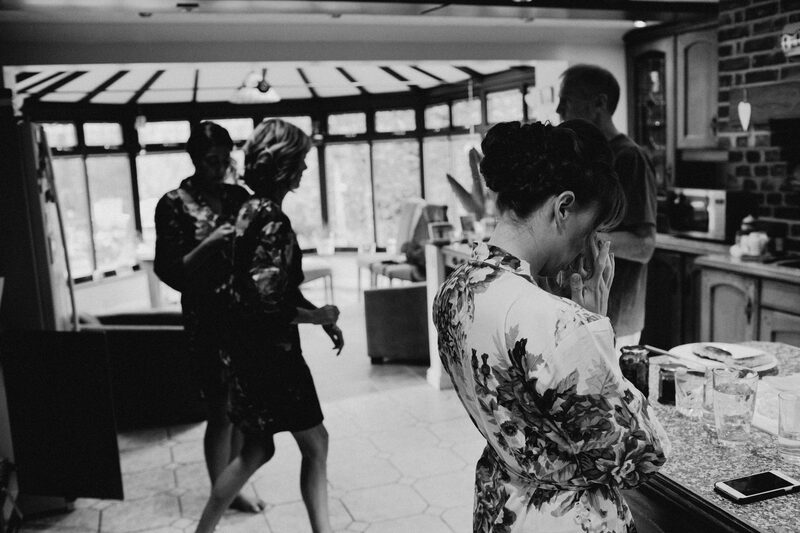 I started the day with Laura and the bridal party. 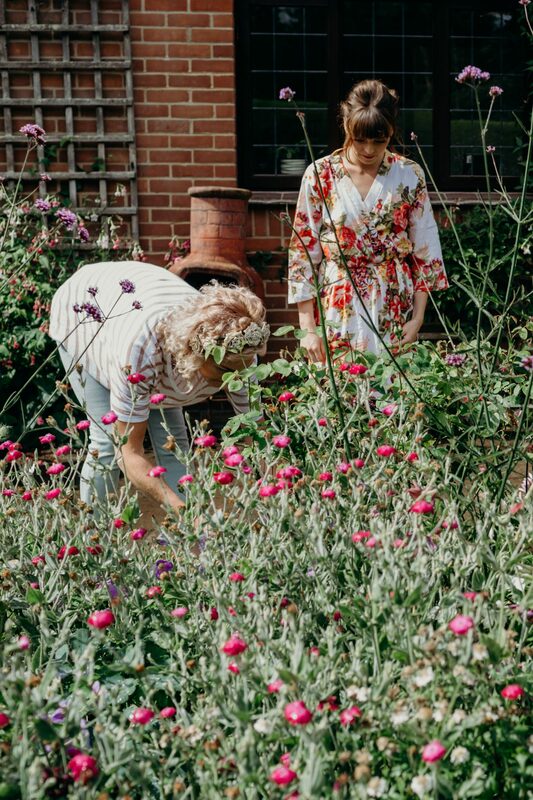 While capturing the hair and make up preparation we noticed the flowers hadn’t arrived. 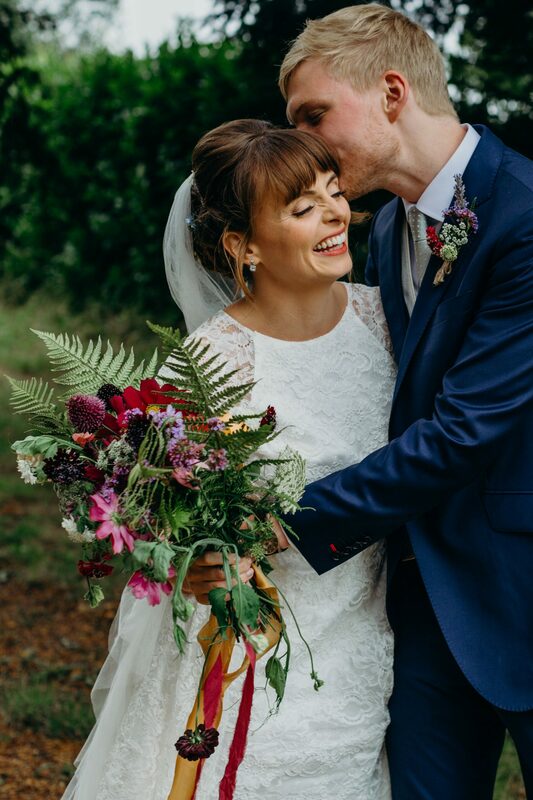 Laura called the wedding florist and due to a diary error they were not on their way with the flowers – in fact they were on holiday! 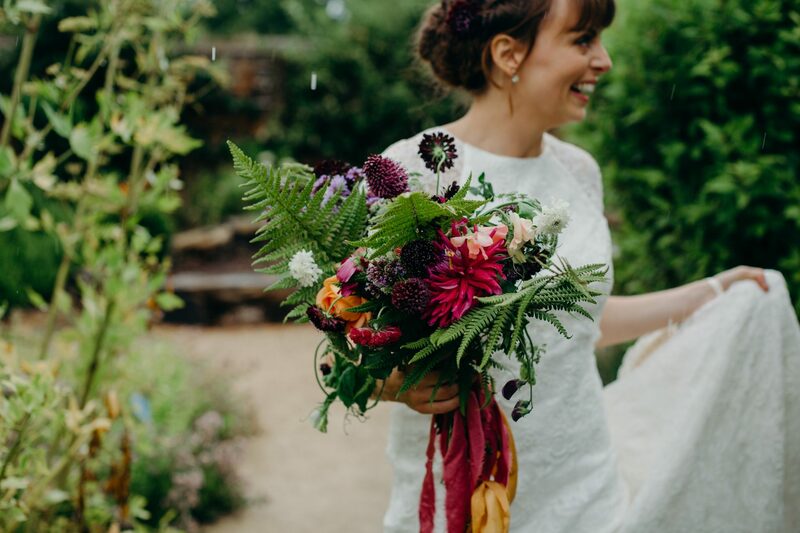 In keeping with my reportage-style of photography coverage, I continued to shoot discreetly while Laura and her bridal party picked flowers from the garden to use in her wedding bouquet. 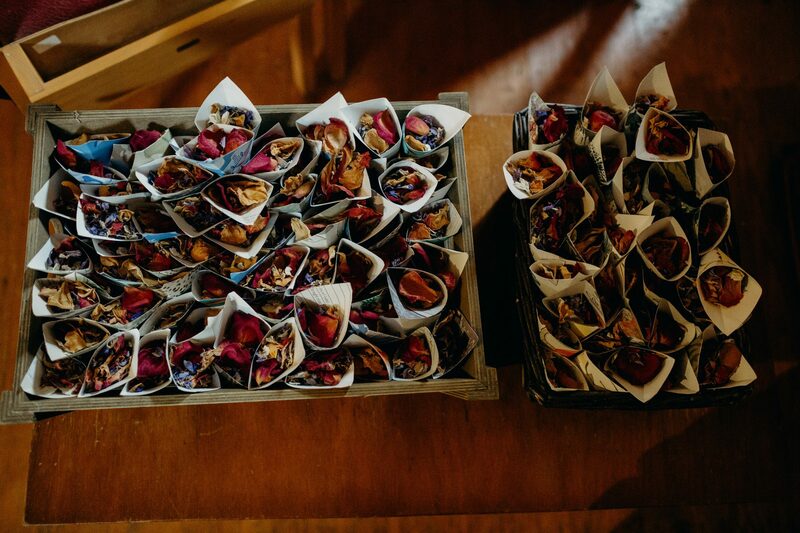 However, the DIY bouquet solution was not needed. 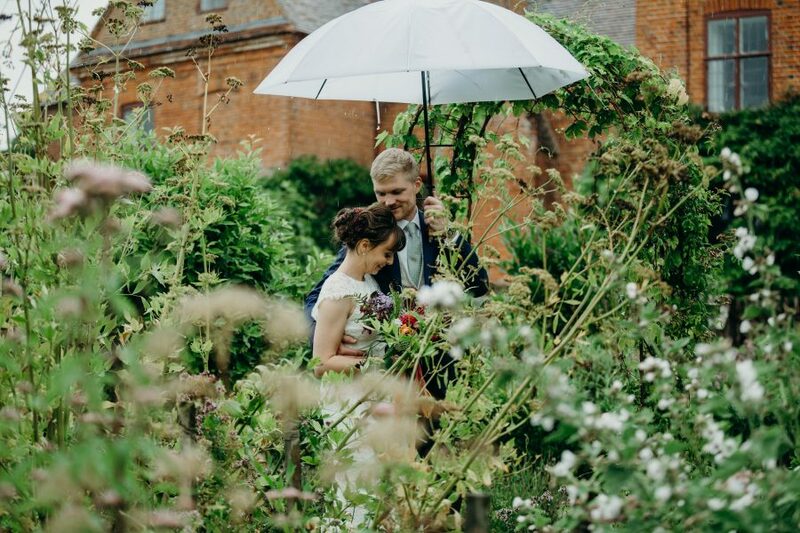 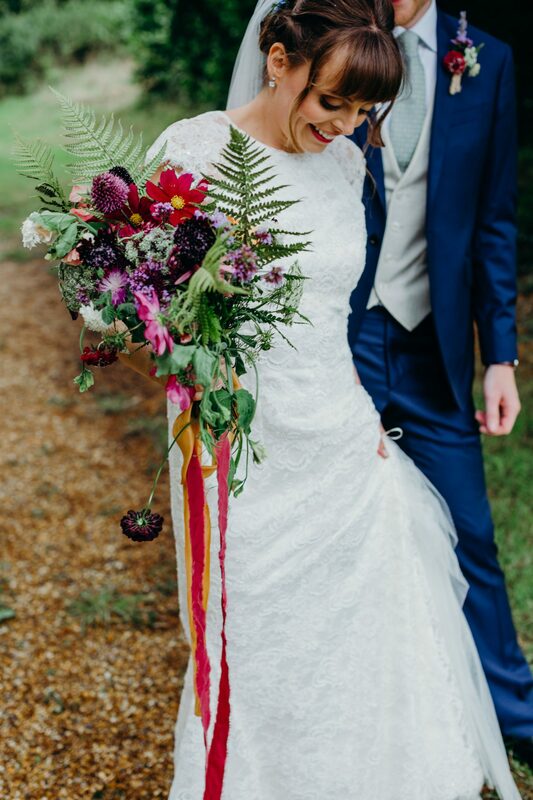 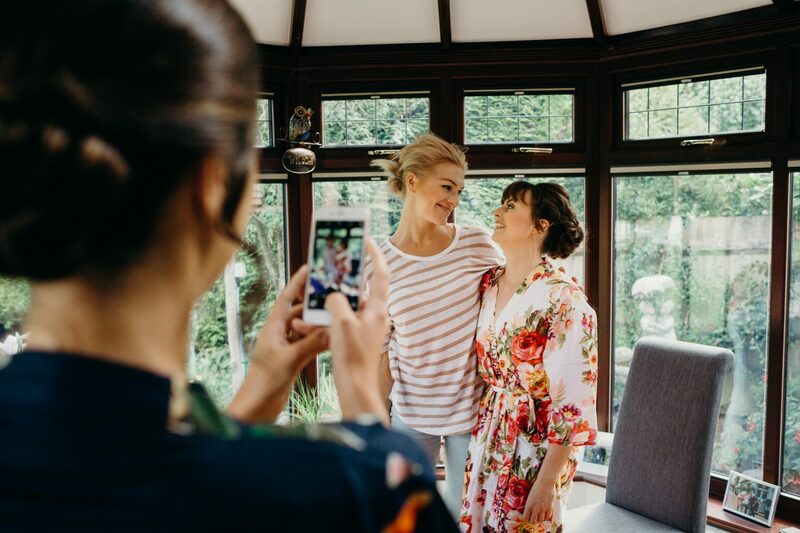 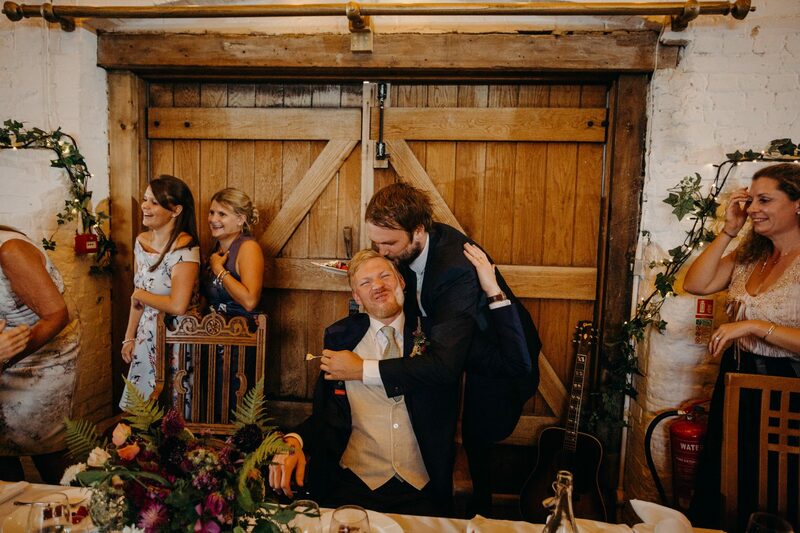 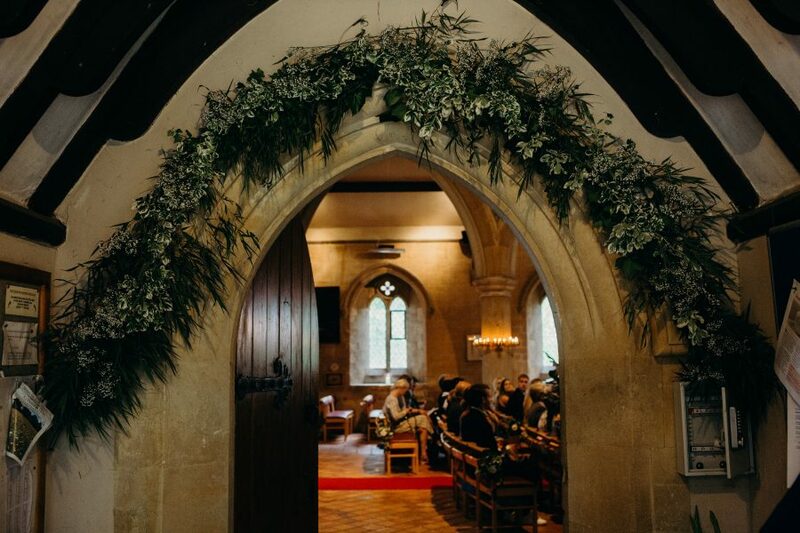 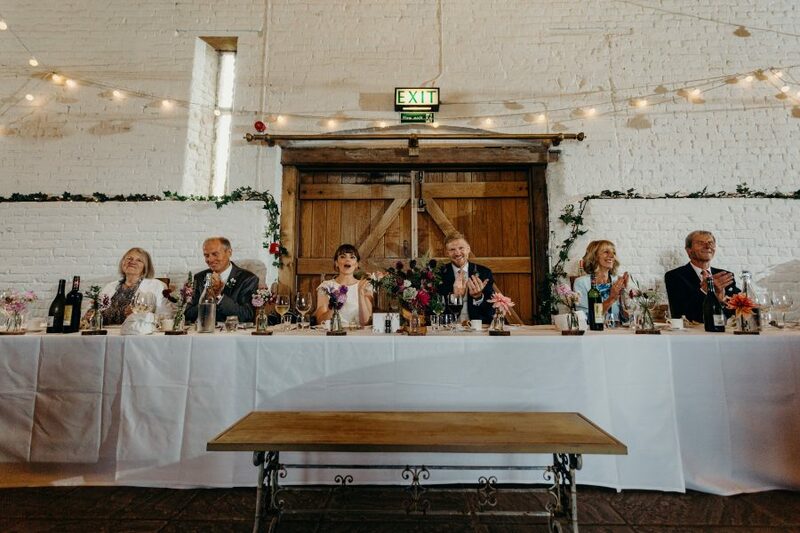 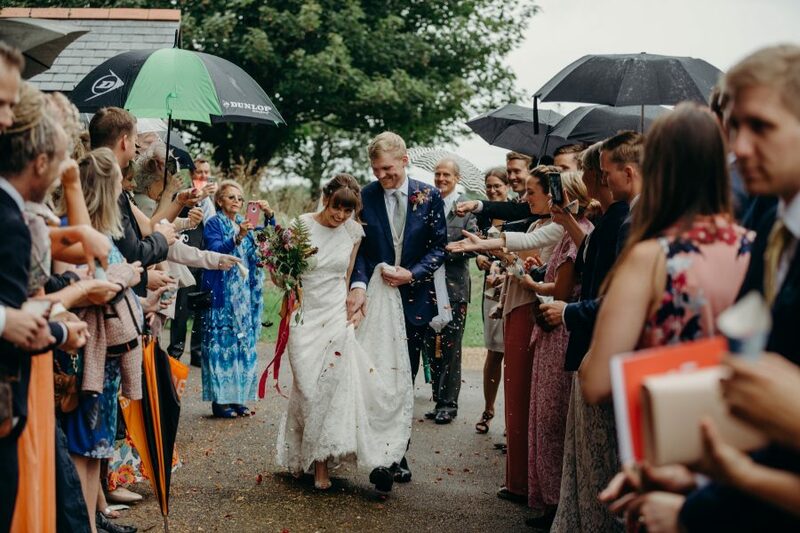 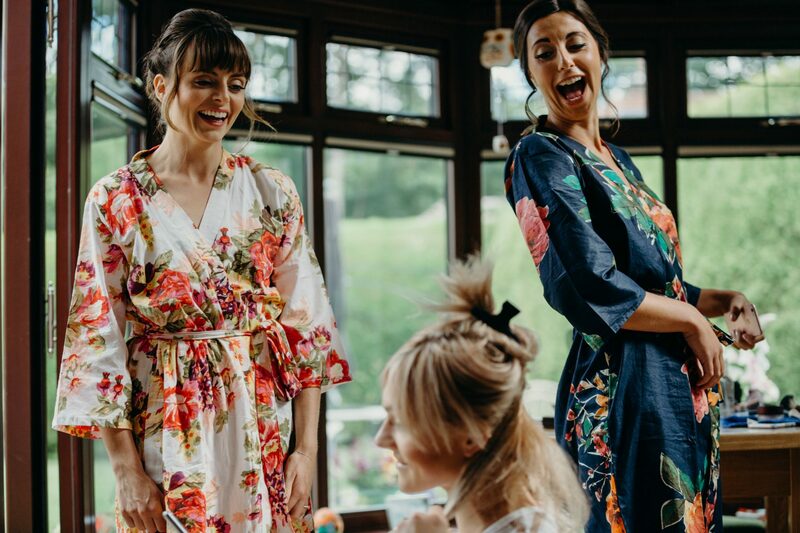 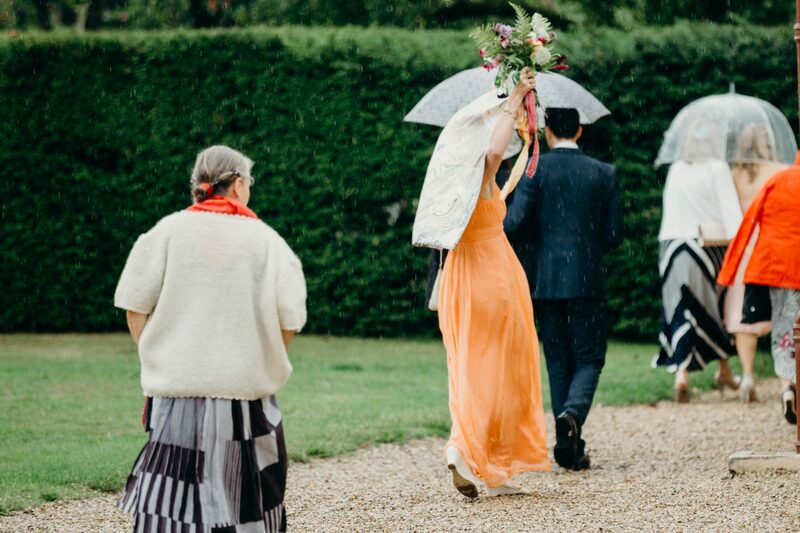 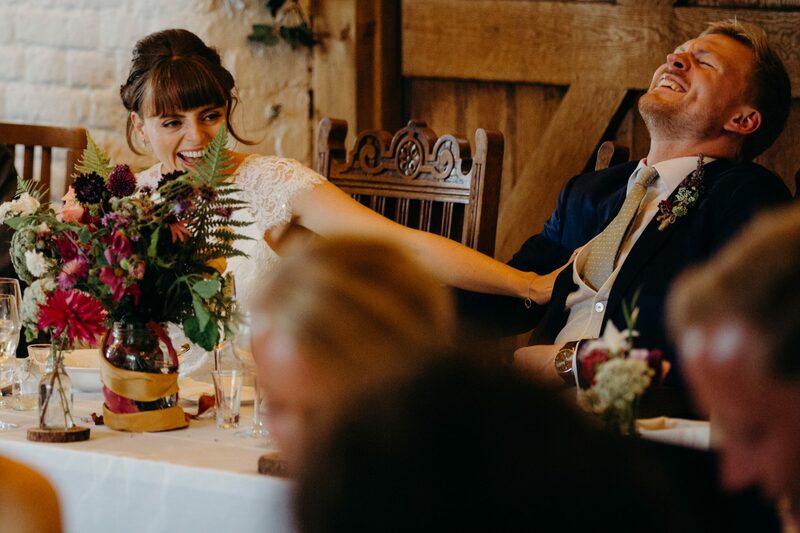 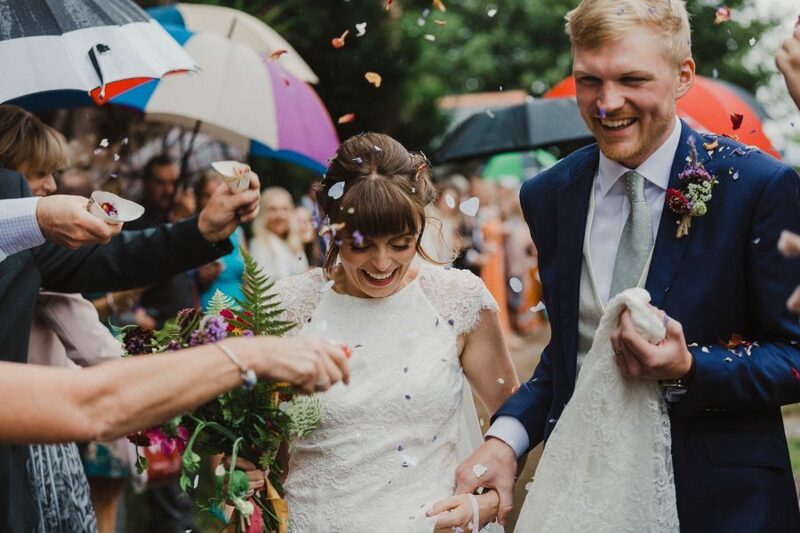 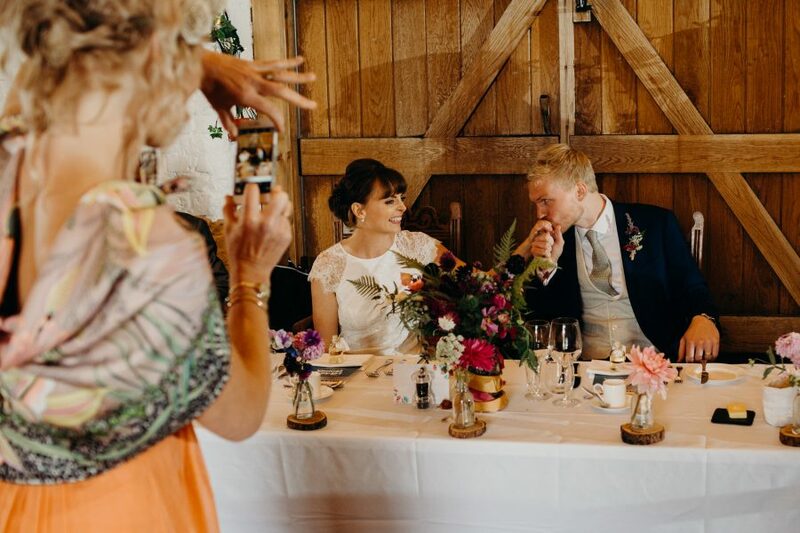 Ufton Court’s excellent wedding planner swiftly arranged new flowers for the venue and the florist pulled out all the stops and a beautiful bouquet appeared. 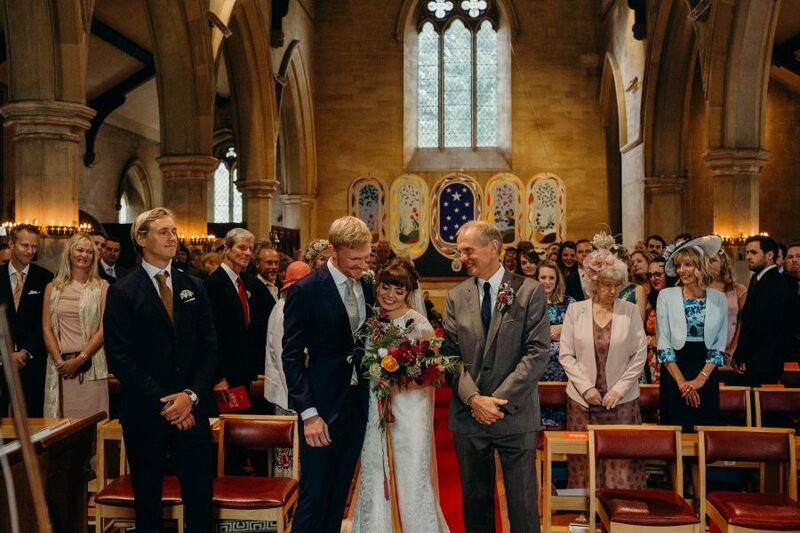 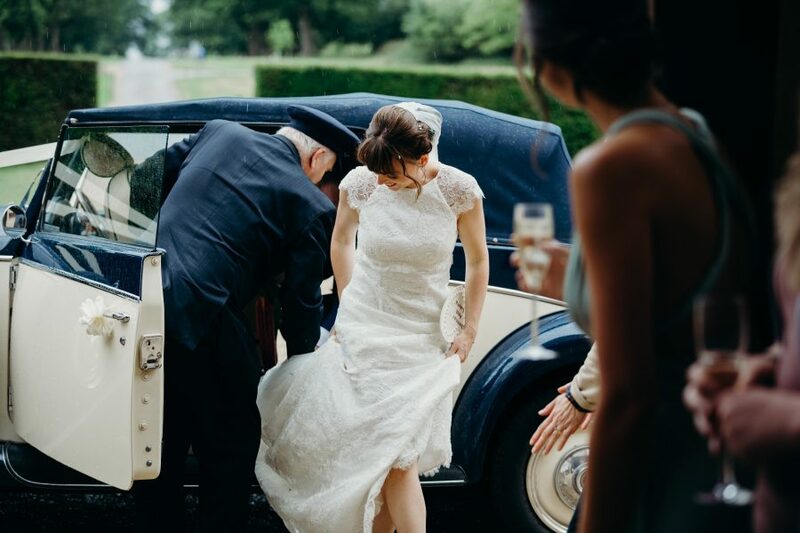 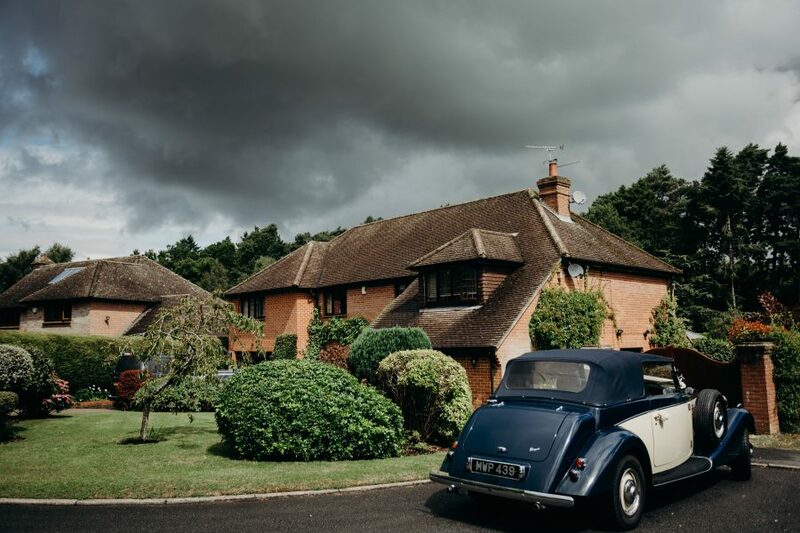 Laura arrived at Ashford Hill Church, Thatcham with her father in a vintage Rolls Royce. 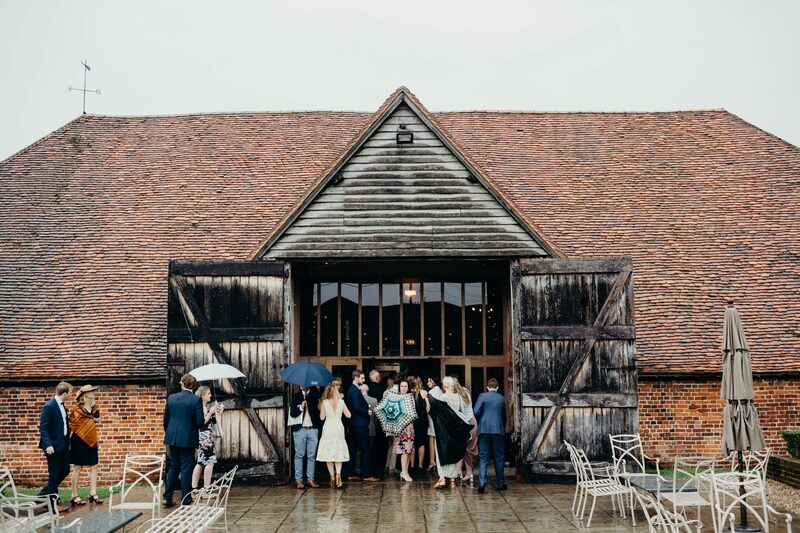 After the wedding vows, we headed to Ufton Court for the wedding reception. 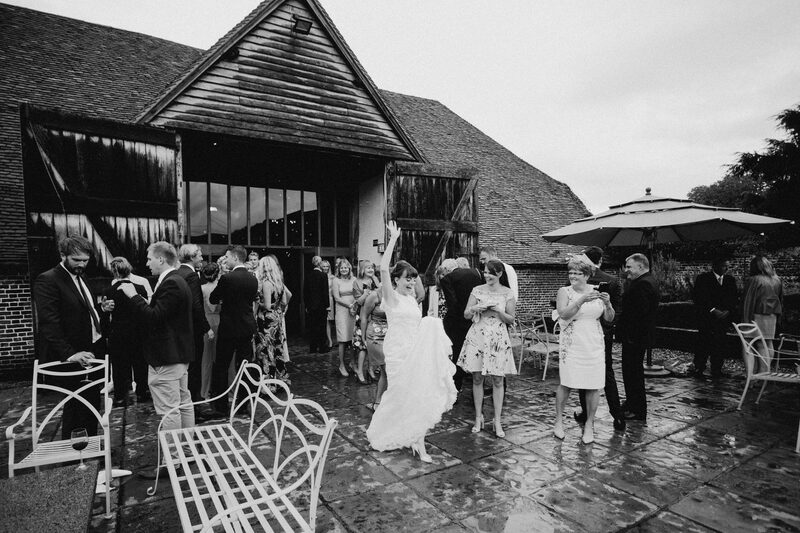 Summer is a beautiful time to have a wedding at Ufton Court. 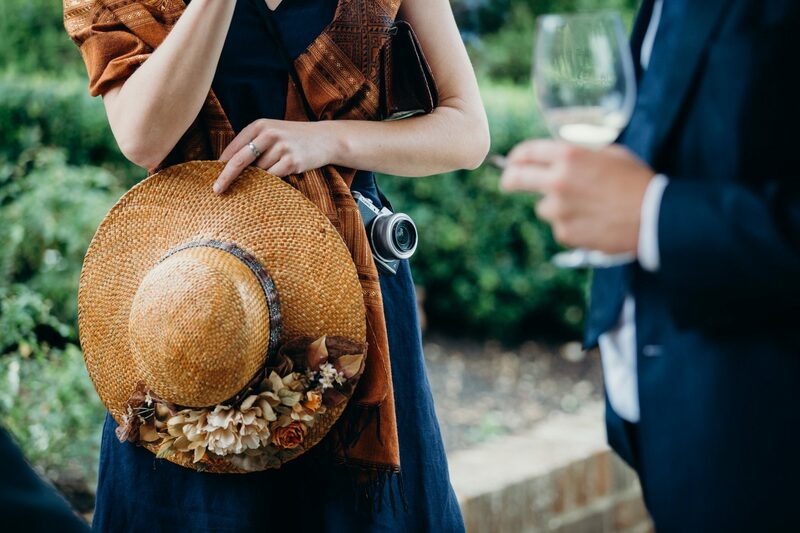 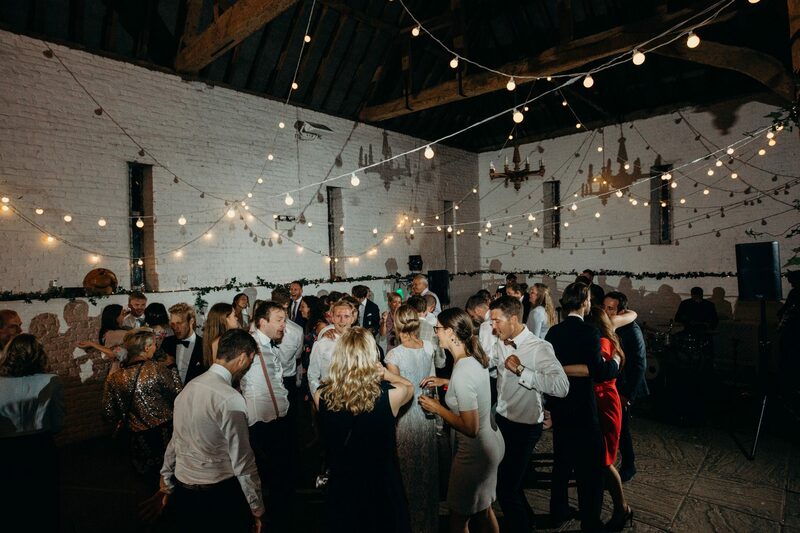 Ordinarily guests would enjoy the smells of fragrant lavender and flowers, whilst drinking champagne in the barn courtyard. However, with the storm clouds brewing overhead guests headed straight into the 16th century Tithe Barn. 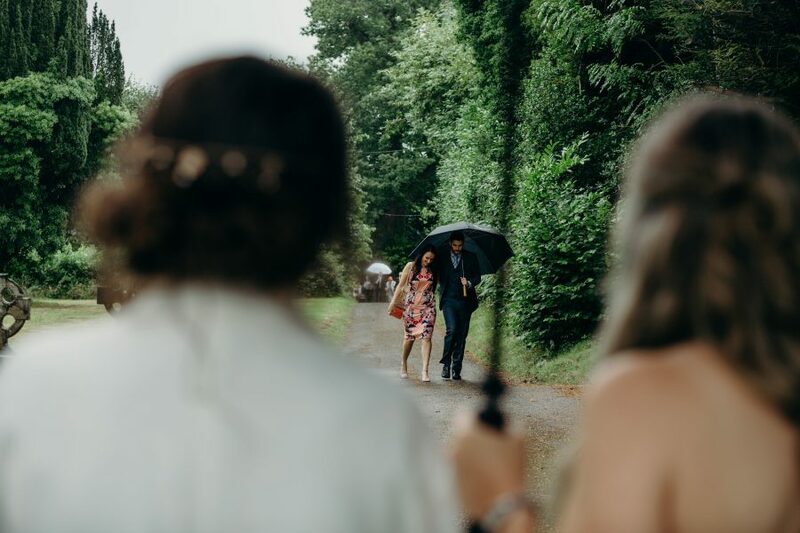 Laura and Gunnar were admirably happy to brave the rain to capture some couples portraits. 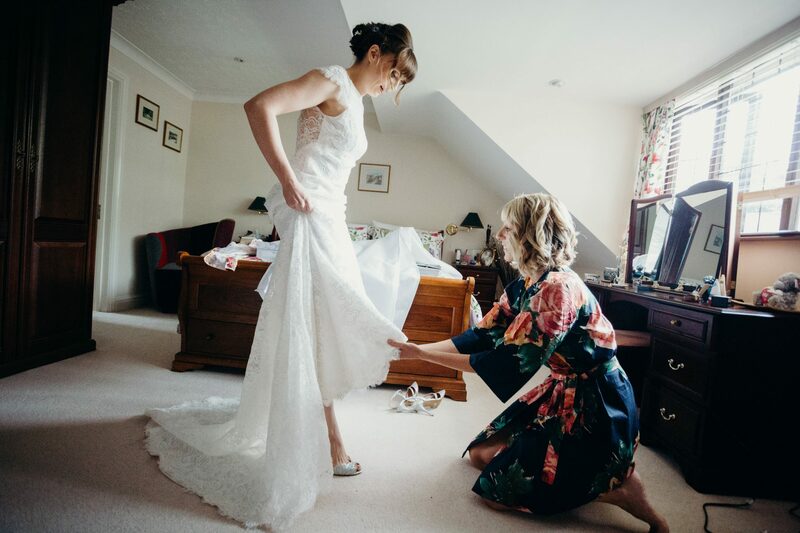 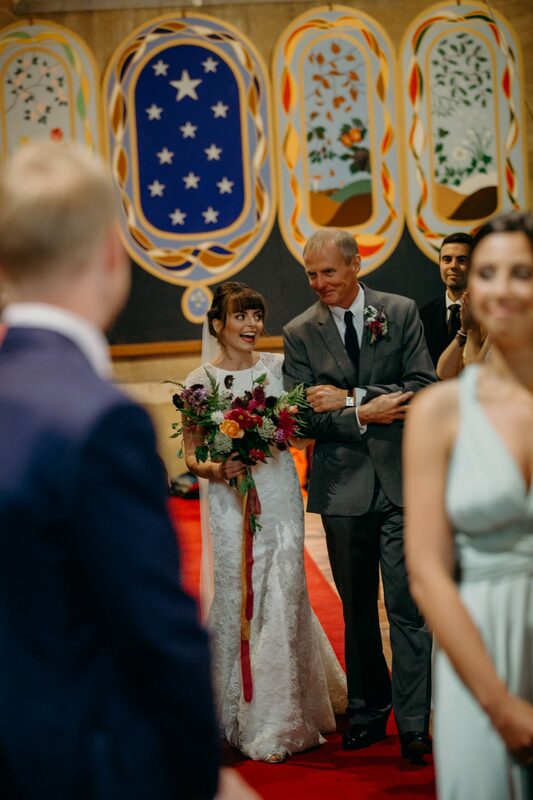 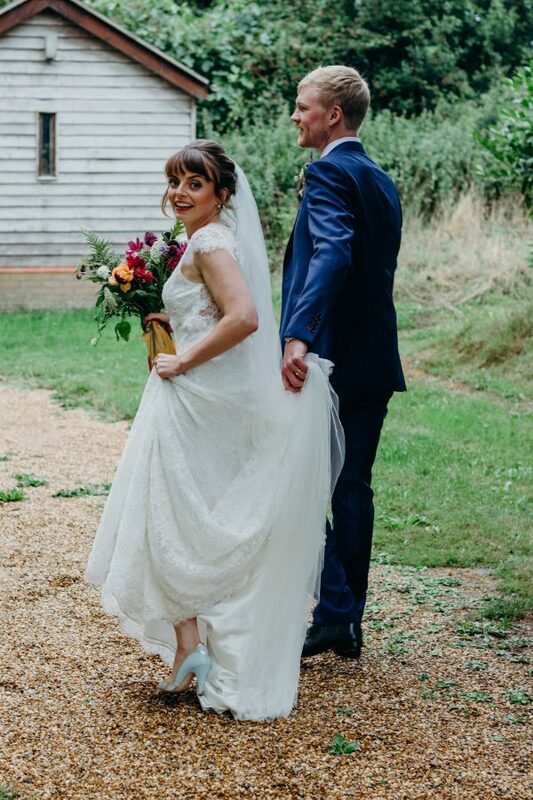 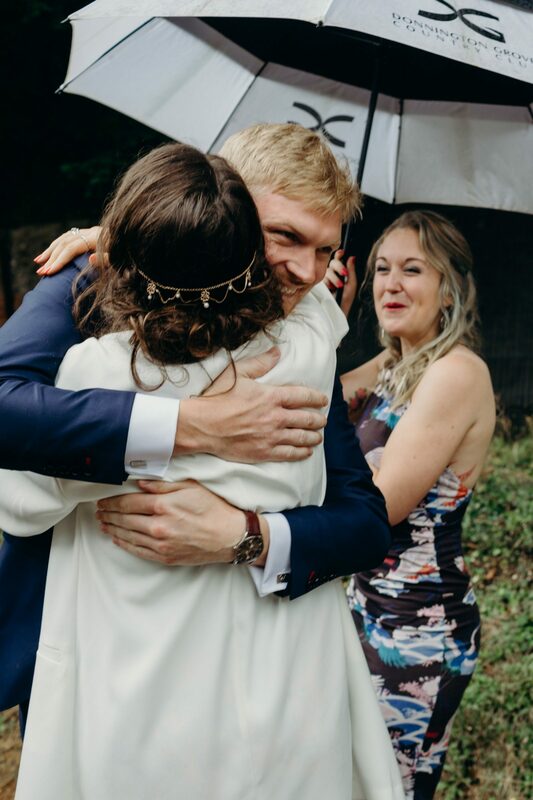 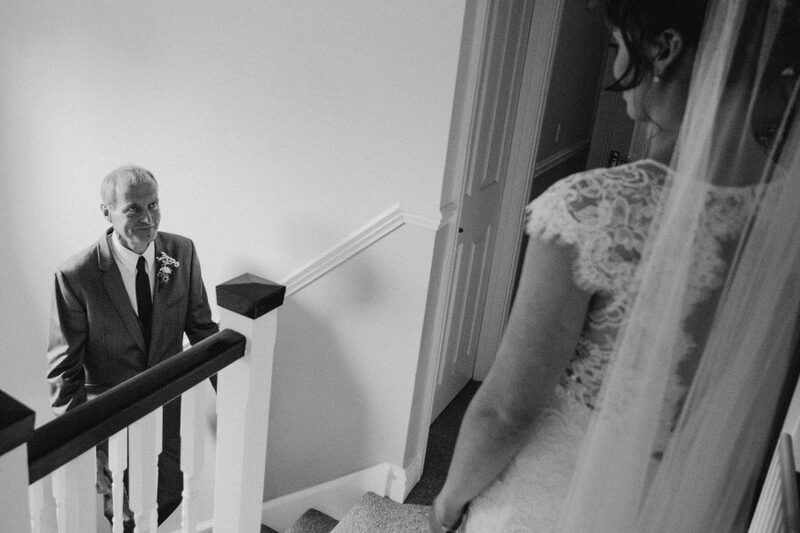 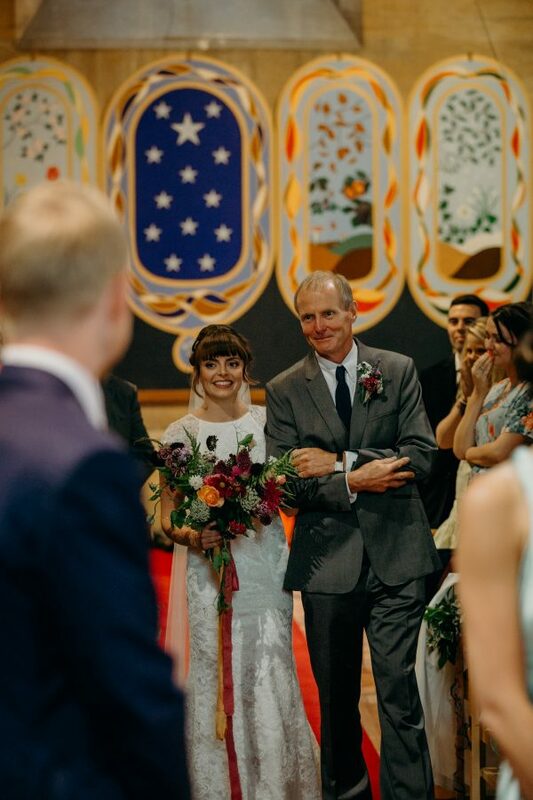 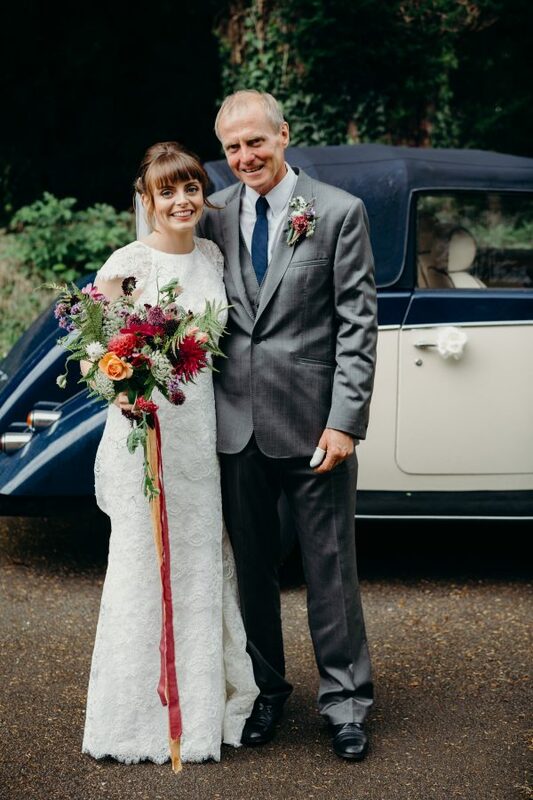 I am so glad they did, Laura’s beautiful Caroline Castigliano wedding dress combined with the impromptu wedding bouquet made some of my favourite images of the year. 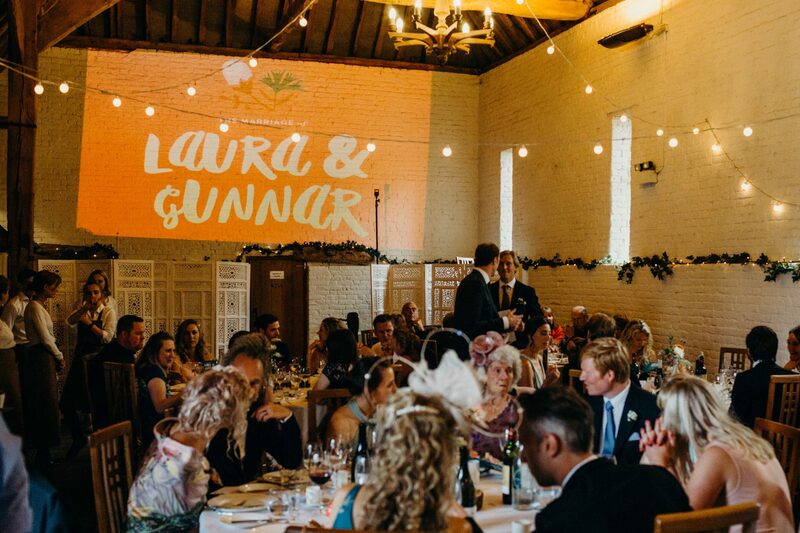 Gunnar’s Swedish heritage made for a very fun wedding breakfast. 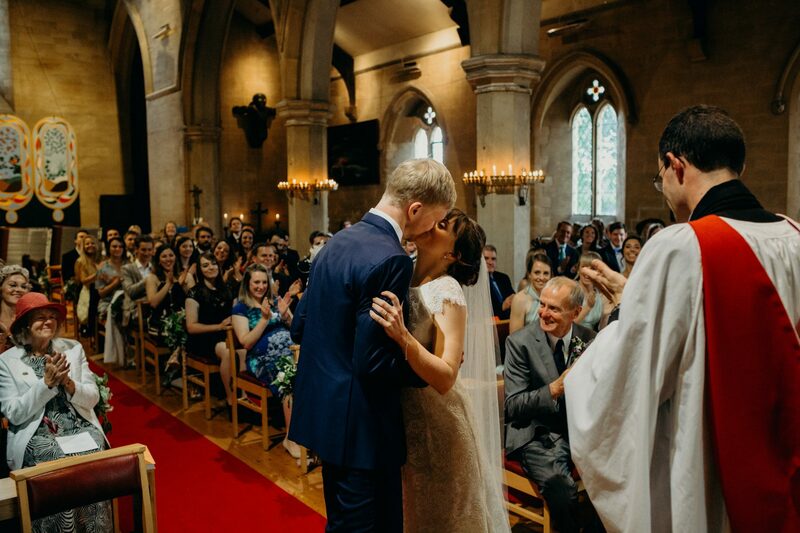 When the bride leaves the room it’s traditional for all the women to line up to kiss the groom. 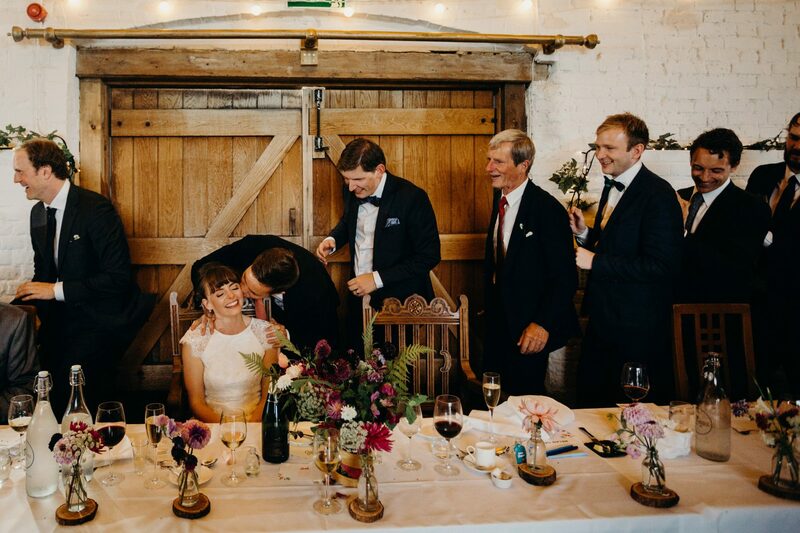 And when the groom leaves the room to go to the bathroom then all the men get up and kiss the bride. 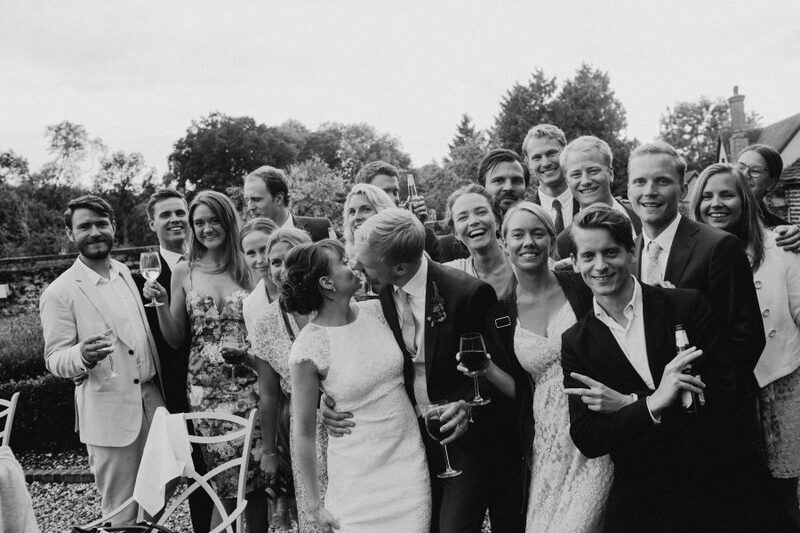 Of course, many of the men also lined up to kiss Gunnar! 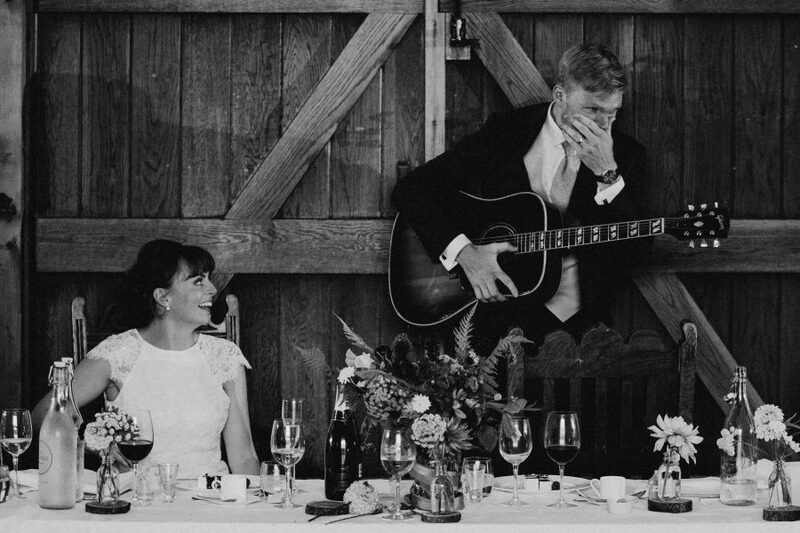 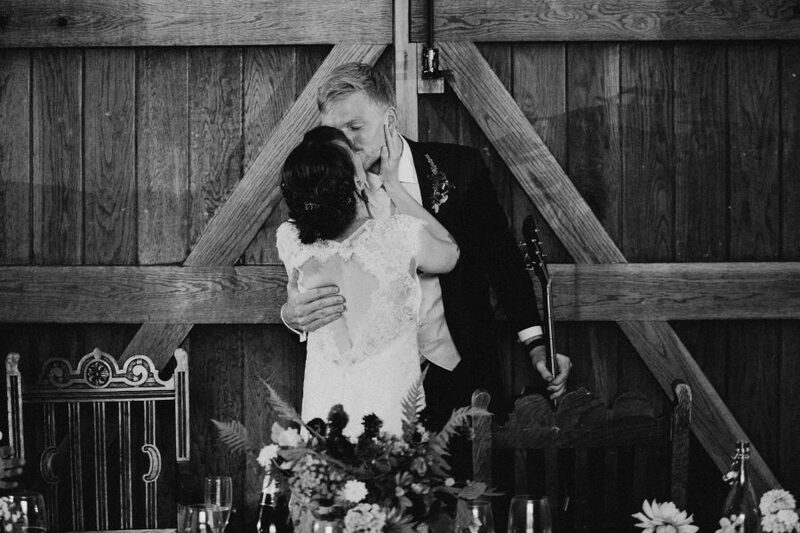 As part of his wedding speech, Gunnar sang a song he had written for Laura, accompanied by his acoustic guitar. There was not a dry eye in the house. 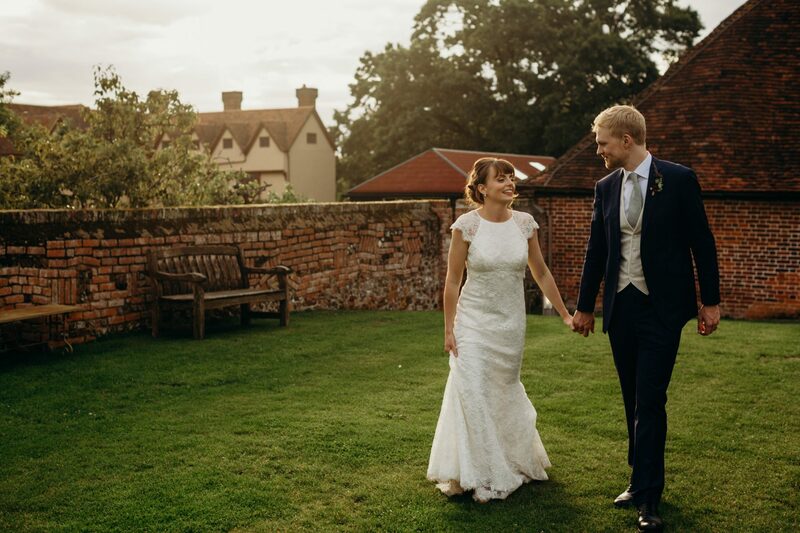 After the wedding breakfast we stepped back outside to capture ten minutes more of portraits in the setting sun. 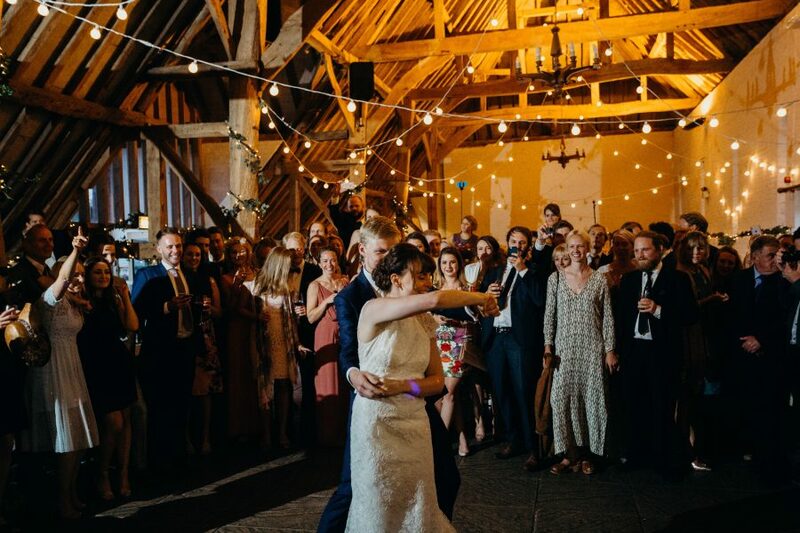 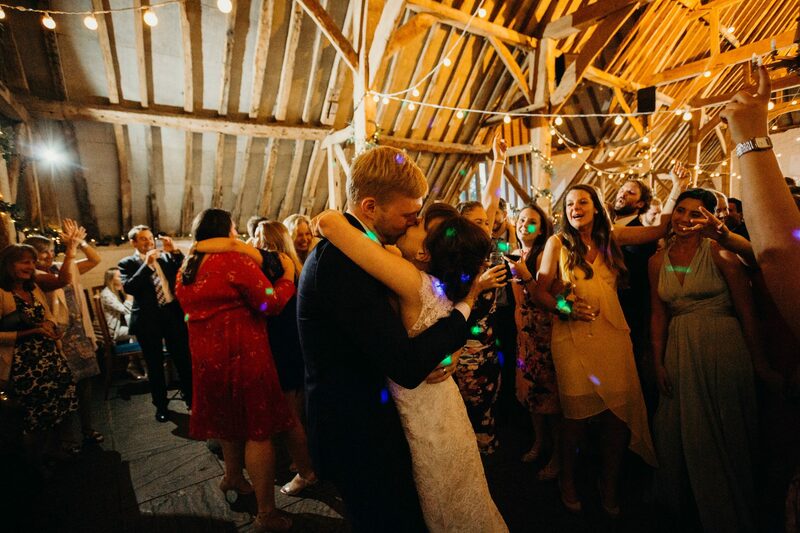 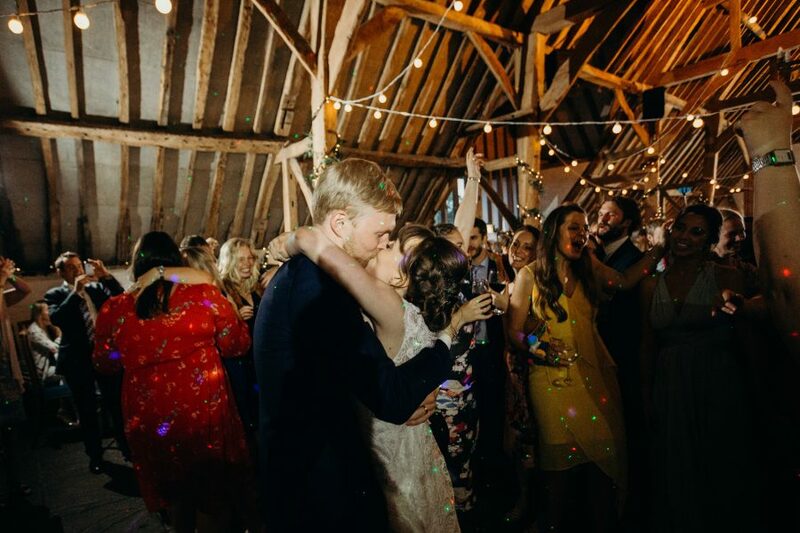 Oakwood Events festoon lighting framed the Tithe Barn perfectly for the first dance. 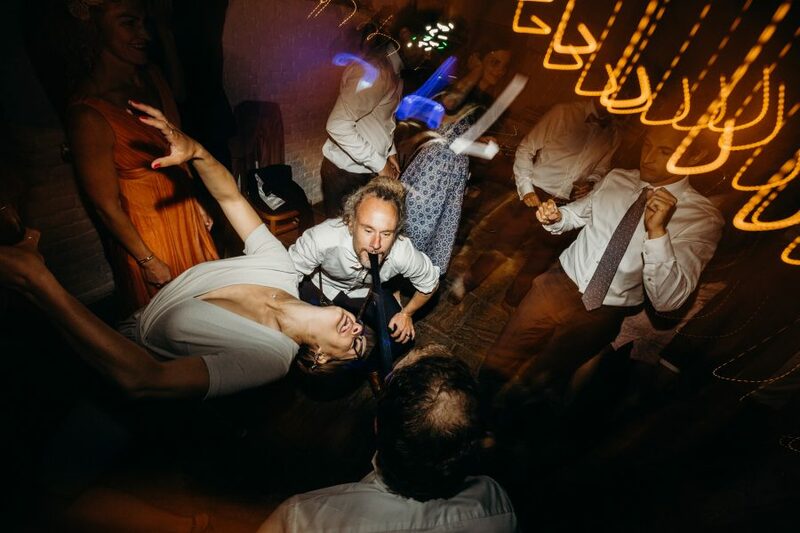 I like to stay late at weddings and this party really did not disappoint with the dance floor packed until midnight. 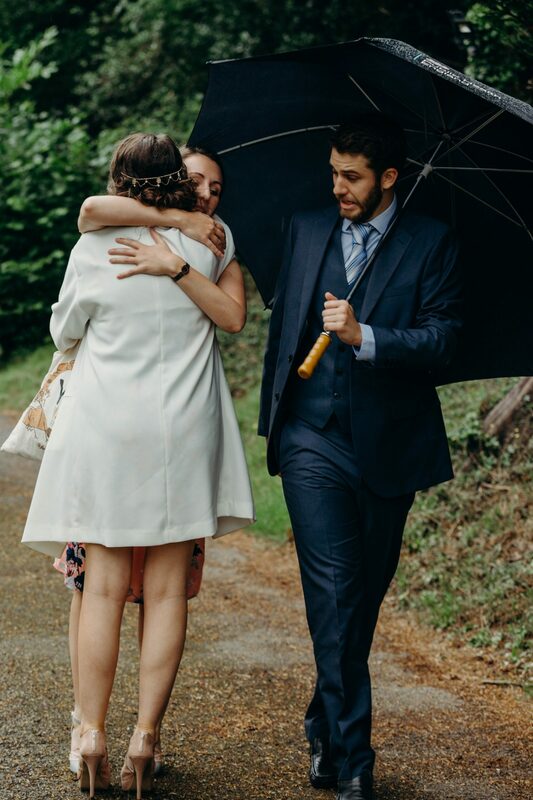 I hope you like the images. 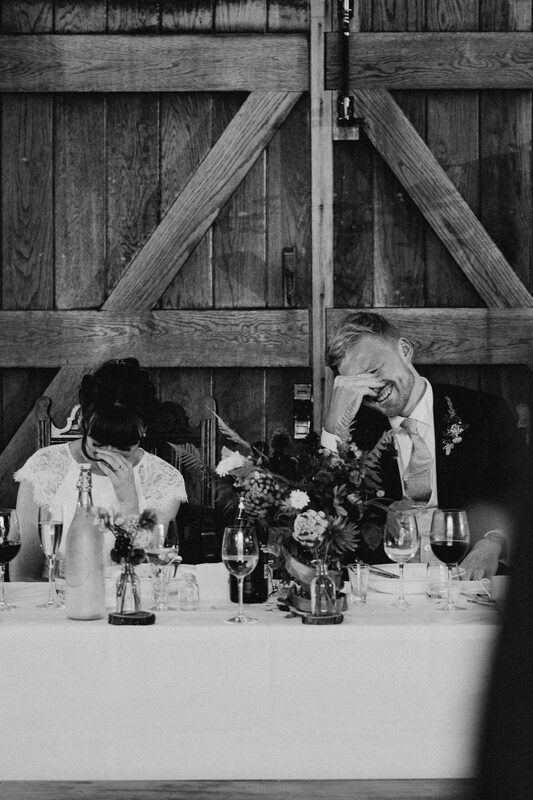 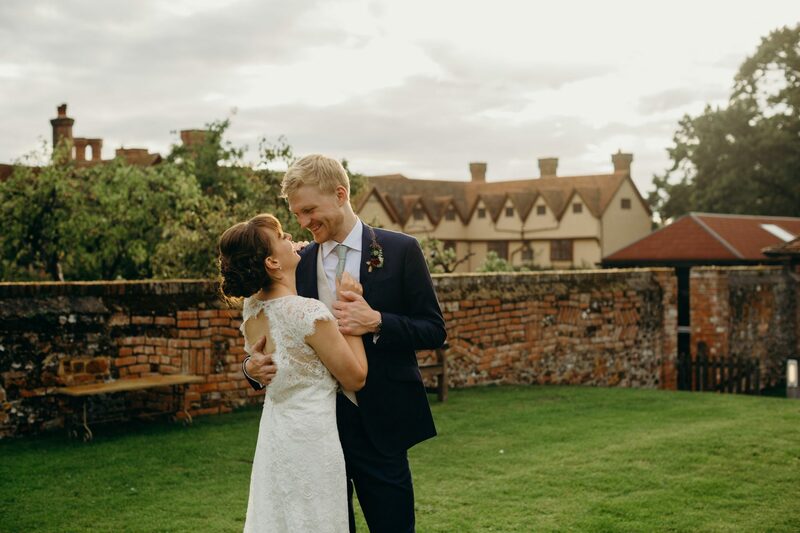 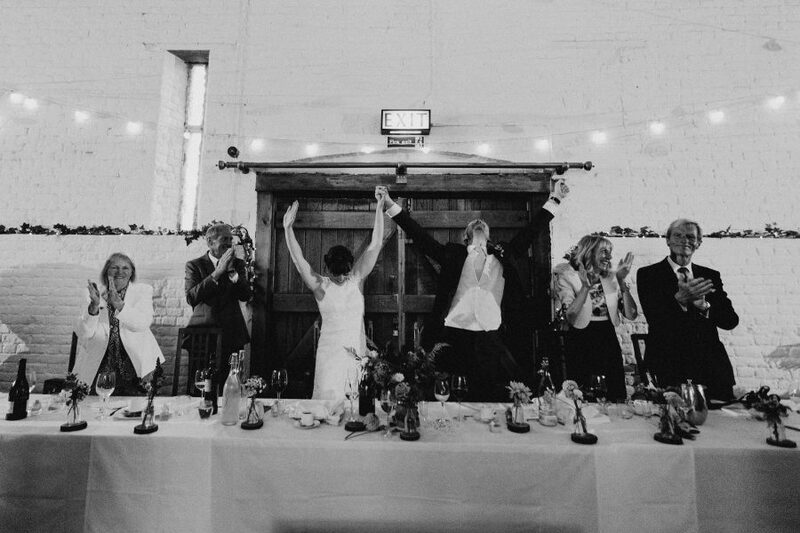 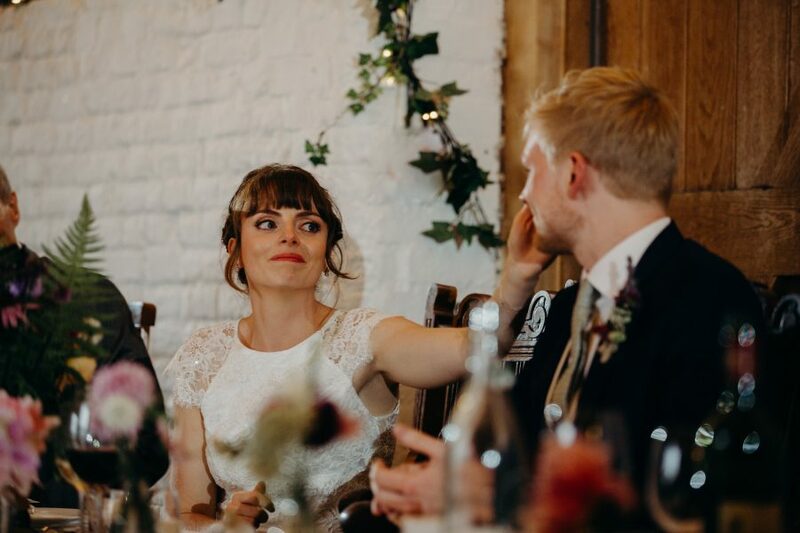 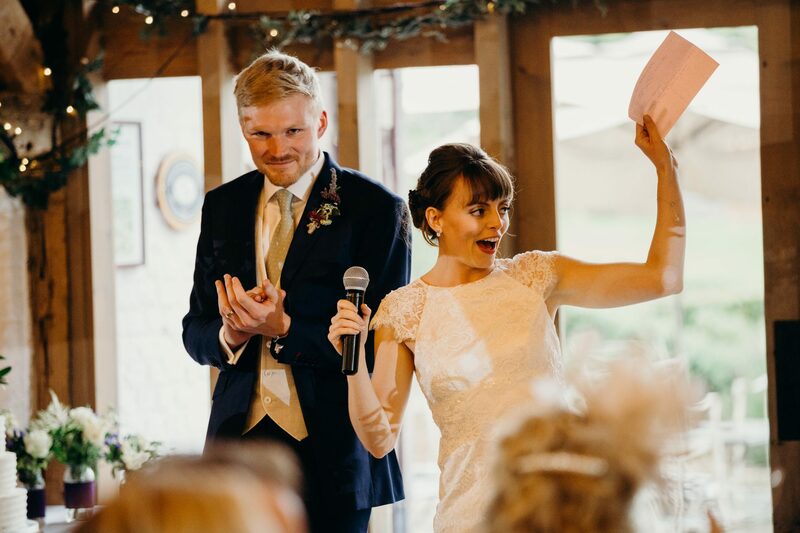 If you would like to see a Winter wedding at Ufton Court, take a look at Megan & Will’s Winter wedding blog. 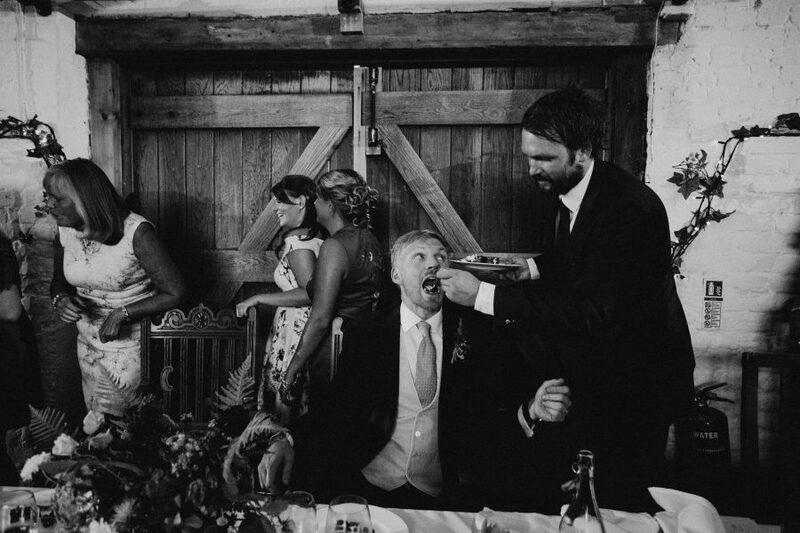 Great storytelling images. 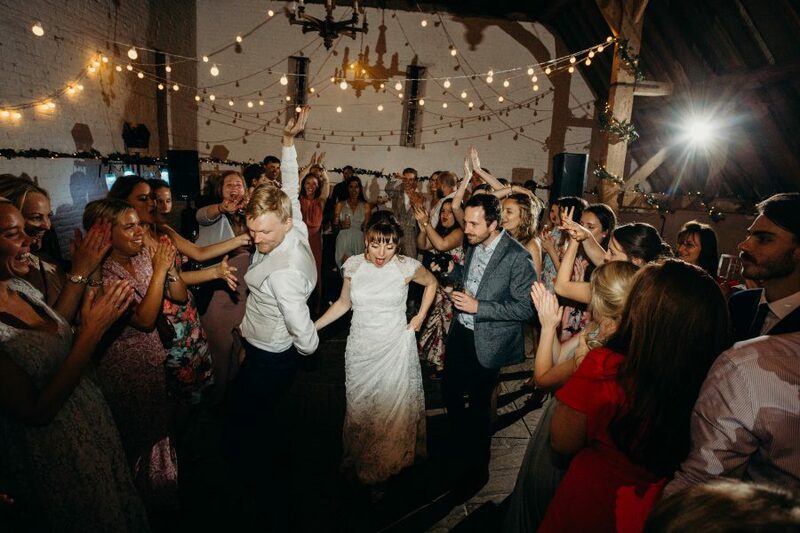 I love the dancing photos. 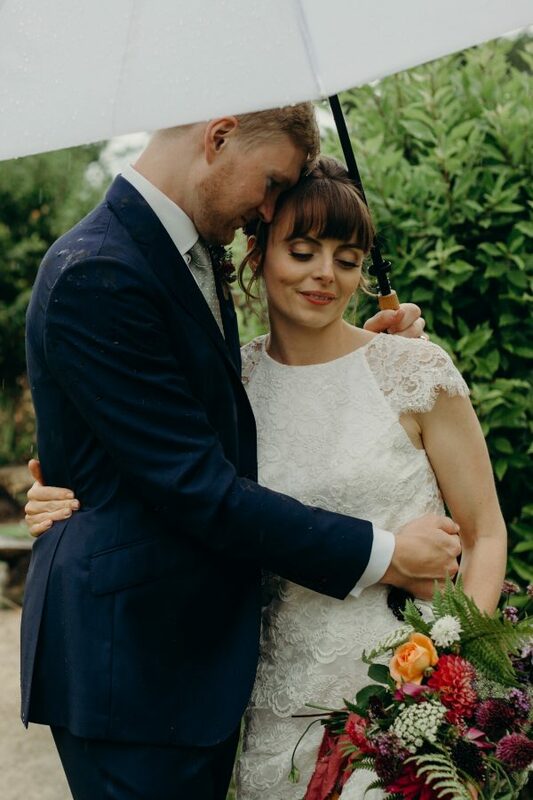 A great job and not easy in the rain. 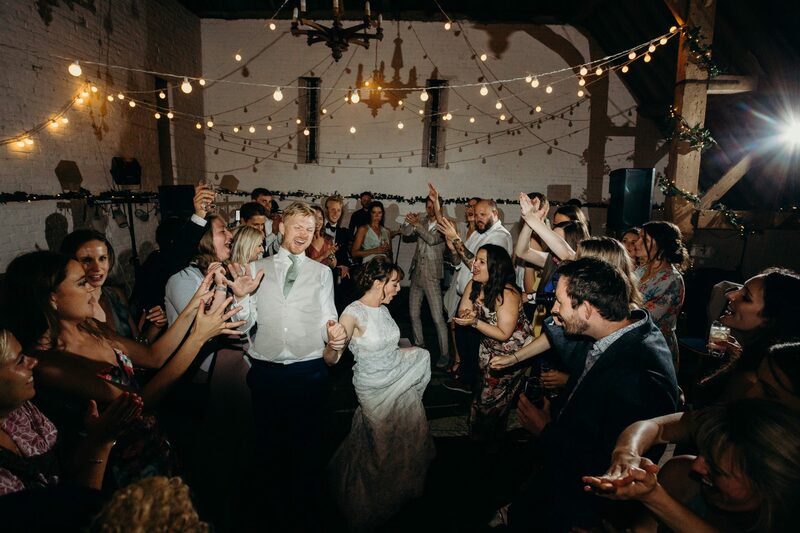 Lovely story telling and killer party shots. 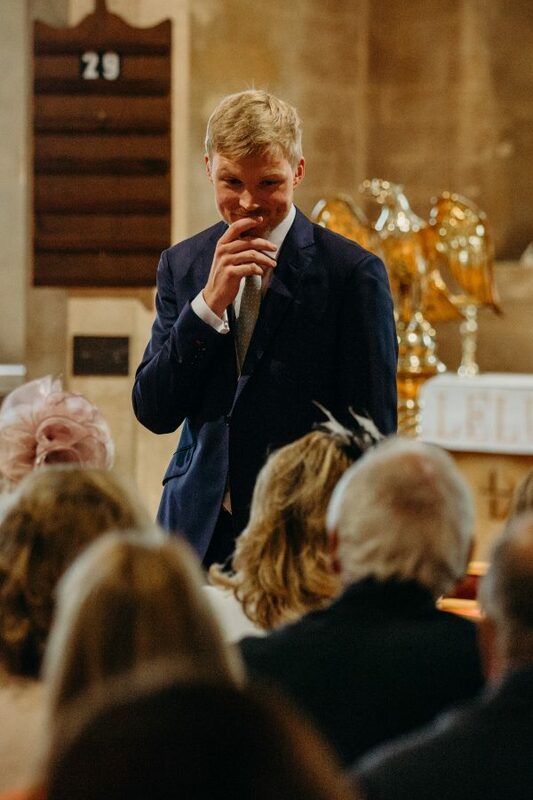 Well done Jamie.